High performance Optimist upgrade kit, consisting of outhaul, downhaul and halyard system. 3 mm Dyneema outhaul with a partly polyester core for extra thickness which creates grip in the cleat. 3 mm spliced Dyneema downhaul with 6 mm Technora/Dyneema for ultimate grip. The non-spliced Dyneema end has enough length to be tied or spliced around the boom. Cordura/Dyneema halyard with a spliced loop on one end to be fixed easily on the mast cleat. The other end is tapered which makes it thin enough to fit through the halyard handle. 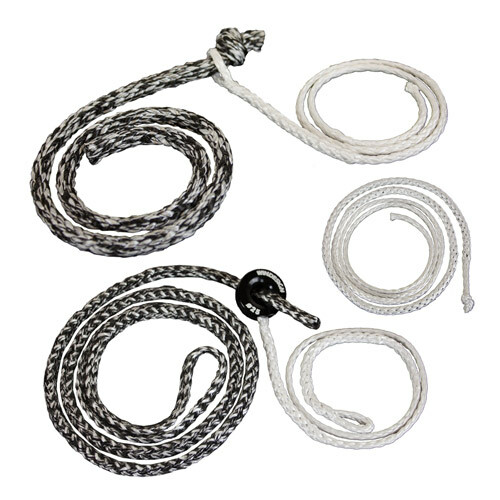 This halyard system comes with the EX1349 Dyneema replacement halyard with spliced on low friction ring.